Prostate cancer is a malignant tumor that affects the prostate, a walnut-sized gland in men located below the bladder. Prostate cancer is the third most common cause of cancer-related death among men of all ages, the University of Maryland Medical Center says. Researchers bathed isolated prostate cells in a solution containing whey protein and this caused the prostate cells to express more glutathione, a powerful antioxidant, according to EurekaAlert.org. Enhanced levels of glutathione in prostate cells decreases your risk of developing prostate cancer. Your risk of developing prostate cancer is affected by factors such as age, ethnicity, family history and diet. About 70 percent to 90 percent of men by the age of 80 have had prostate cancer, the American Cancer Society says. People of African and Caucasian descent have a higher probability of developing prostate cancer than Latin Americans, the University of Maryland Medical Center notes. If you have brothers who have prostate cancer, then you are about 4.5 times more likely to have prostate cancer. If you have a father with prostate cancer, you are 2.3 times likely to develop it. Eating a diet with a lot of saturated fat will increase your testosterone production. Testosterone stimulates prostate growth and increases your chances of developing prostate cancer. Free radical build-up in the prostate area is closely associated with the onset of cancer, EurekAlert.org explains. Researchers at Ohio State University treated human prostate cells with whey protein for two days and measured the glutathione levels after. The human prostate cells treated with whey proteins increased glutathione levels by as much as 64 percent. The experiment also demonstrated that the sample treated with a dose that was half the concentration of the other increased levels of glutathione by about 60 percent. This suggests that even a small dose of whey protein can be immensely beneficial to prostate cells. Whey protein contains cysteine, an amino acid that increases glutathione in the prostate. Cysteine helps to make healthy levels of glutathione in the prostate. Healthy levels of glutathione in the prostate protects the gland from cancer. As an appetite suppressant, adults should take up to 50 g of whey protein once a day, MayoClinic.com says. The dose can be adjusted to compensate for body weight at a rate of half a gram of whey protein for every kilogram of body weight. The recommended daily dose also varies according to purpose. 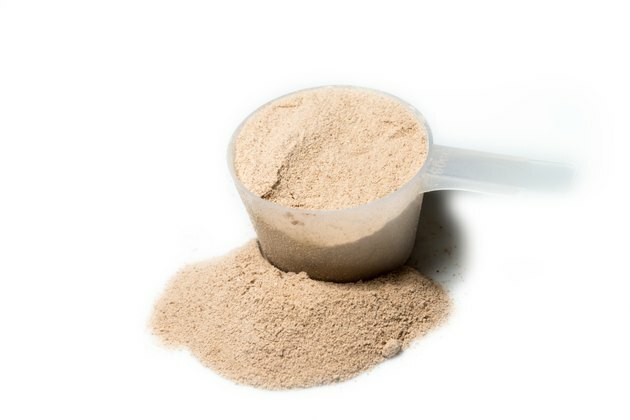 Children under 18 years of age can take 1 g of whey protein per 1 kg of body weight. Whey protein lowers blood sugar levels and may increase the risk of bleeding, MayoClinic.com notes. Diabetics and those with bleeding disorders should seek medical advice before taking whey protein in order to avoid adverse reactions. Whey protein may increase or decrease the effects of medications and supplements, so talk to your doctor before using whey protein. Does Whey Protein Hurt the Thyroid?